It has been an eventful Queen's Day for us and our guests from Michigan, beginning early this morning in Amsterdam and continuing in the little fishing port of Volendam and then the charming village of Edam, famed for its cheese. These lads posing for pictures wore touches of orange in tribute to the Dutch royal family, the House of Orange. A shop window filled with Queen's Day kitsch. Rather quiet street scenes in Edam at day's end. Edam's Town Hall, built in 1737. Dutch flags were flying all over the Netherlands. Back soon with more photos; for now, hostess duties await. ...and gliding away, après un petit déjeuner chez moi. An unexpected discovery in our garden. (As always, click photos to view detail). ...and pale pink and white blossoms against a backdrop of a weeping willow on the opposite bank of the canal. A moment of calm (with the boat still on the deck, awaiting warmer temperatures). Unusual purple and blue hortensia (hydrangeas), a gift from dinner guests last weekend. Hope you're having a lovely Sunday, whatever the weather! P.S. Have you read Frank Rich's alarming piece the Sugar Daddies, the old, conservative white guys who are trying to buy the American election??!! Artful displays at Sophie Pretelat's antiques shop in the Loire Valley, France. Sophie - who lives in a magnificent chateau filled with fantastic and rare collections - has a real talent for arranging seemingly disparate objects into intriguing tableaus. I am lucky to have purchased some treasures from Sophie's antique shop, as well as her stands at brocantes at Bastille and Saint-Sulpice. One of the eye candy books waiting in my "must read soon" pile is Creative Display by Geraldine James. The book is packed with ideas to mix it up a bit, with items both precious and sentimental. Another book in my mailbox this week is blogger Nichole Robertson's Paris in Color. She is a New Yorker, who took photos of Paris on visits to the French capital. John Baxter's The Most Beautiful Walk in the World: A Pedestrian in Paris is also awaiting my attention. More about this book later; I'm hoping to catch up with all these delightful echoes of Paris soon. In a remote area in Bani Hamida Mountain in Jordan, this woman was making yogurt in front of her house. She beckoned us over to watch, as she shaped the yogurt into balls. The yogurt is then be left to dry in the sun. Later, bits are broken off and used in meals - particularly in mansaf, Jordan's much-loved national dish. I once was with a Jordan Television crew at an army outpost in the desert. Lunch - in my honour, as the only female present - was a giant platter of mansaf. Everyone dug in, using their hands. Thankfully, an army officer handed me a spoon. 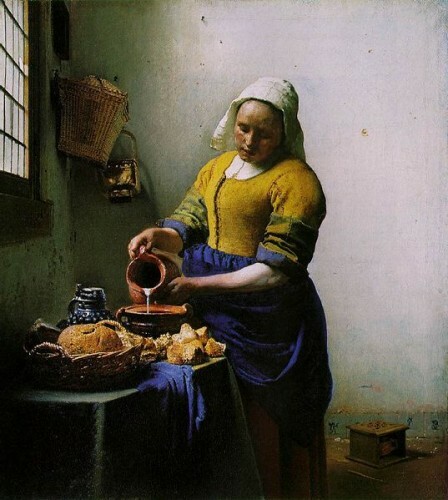 Something about these pictures (above and below) reminds me of Johannes Vermeer's painting The Milkmaid. If you visit Jordan, be sure to try mansaf for at least one meal! ...but when the swan turns up at my deck wanting food, he angrily hisses if he doesn't get his way. The Mallards follow at a safe distance, hoping for leftovers. These creatures remind me of certain American politicians: on the surface, they try to portray a kindly countenace, denying a "war on women." But behind the scenes, they engage in concerted efforts to dismantle 60 years of hard-fought reproductive rights. This week the Republican National Committee chairman laughingly dismissed such talk as "like a war on caterpillars." Yet actions speak louder than words. In the past year alone, legislators in 39 states have introduced nearly 500 bills to strip, suppress or deny women's long-established reproductive rights and erode basic civil liberties. Read more here about conservative lawmakers' numerous brazen attempts to defund women's healthcare and undermine equality in the workplace. Bizarrely, conservative male Republicans seem determined to unravel women's reproductive choices and workplace rights, while decrying government intervention into people's lives! The bookcase contains language and photography books, an antique book press and my iPod. Vintage American typewriters from the 1940s and 1920s rest on an alphabet chest handmade by Luke Ellis of Kent & London. On the wall is an original Henri Cartier-Bresson photo of boats in the Bois de Boulogne, Paris (my old neighbourhood); a Mucha Art Nouveau alphabet drawing from 1901 and an oil on wood painting of nightfall over Santa Fe by Greg Moon of Taos, New Mexico. The 1950s Tolix stool is French and the Louis Poulsen suspension light is from Denmark. The colour-block tiles belonged to the house's previous owners; am still searching for a rug. The door leads to a balcony overlooking the garden and canal. Ed. note: This post was amended on June 25, 2013 to add a watermark to the photo, which has been widely misappropriated. The 10th-century St. Saulve Abbey in the charming medieval city of Montreuil-sur-Mer, France. Read some of my previous posts about this walled city that inspired Victor Hugo's book Les Miserables here, here, here, here and here. Vignettes from my home office space, the Netherlands.